Kamau Austin is a God Loving Dadpreneur who has been tested in life especially the last few years and overcame cancer while also helping his daughter fight autism. In the process Kamau was abandoned and pushed to the brink of his existence. Rather than give up to his illness, treatments, betrayals and become bitter Kamau tapped the Spirit within. He used self reflection, prayer, fasting, Spiritual intimacy, consecrations, and meditation to reverse his fortunes and transform his life. Kamau's Qu!ps are insightful Quotes to Live by and aim to help you Live Life Wisely with Words of life. His Quotes are SoulFood for the Heart, Mind, and Spirit. 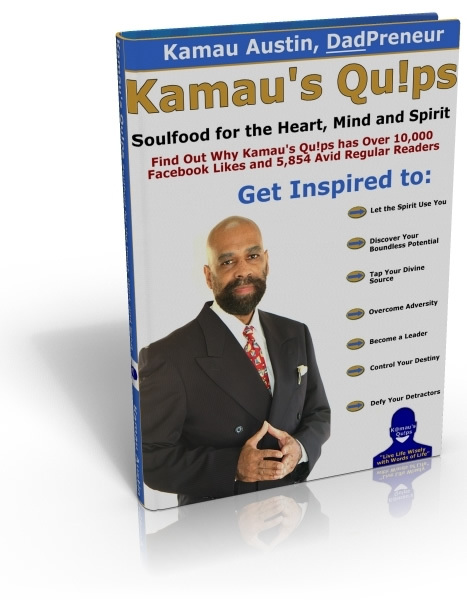 Order Kamau's Qu!ps and be inspired, uplifted, and Spiritually empowered to reach your boundless potential.